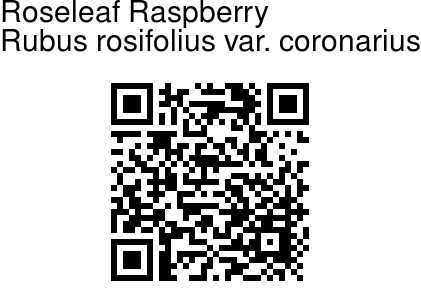 Roseleaf Raspberry is an erect of climbing shrub, 2–3 m tall. Branchlets are grayish brown or dark reddish brown, with straight to curved prickles and yellowish glands. Leaves are compound, with usually 5–7 leaflets. Leaf stalk is 2–3 cm long. Stalk of terminal leaflet is 0.8–1.5 cm, lateral leaflets are nearly stalkless. The leaf spine has sparse, minute prickles. Leaflets are ovate or ovate-elliptic to lance-shaped, 4–7 × 1.5–5 cm, with sparse, minute prickles along midvein, and margin sharply doubly toothed, with a long-pointed tip. Flowers arise at the end of branches or in leaf axils, either singly or doubly. Flower stalk is 2–3.5 cm long. Flowers are double, 2–3 cm in diameter, fragrant. Petals are white, oblong, narrowly obovate, or nearly circular, 0.8–1.5 × 0.8–1.2 cm. Stamens are many, shorter than petals. Pistils to 2 mm, shorter than stamens. Fruit is red, ovoid-round or narrowly obovoid to oblong, 1–1.5 × 0.8–1.2 cm, smooth. 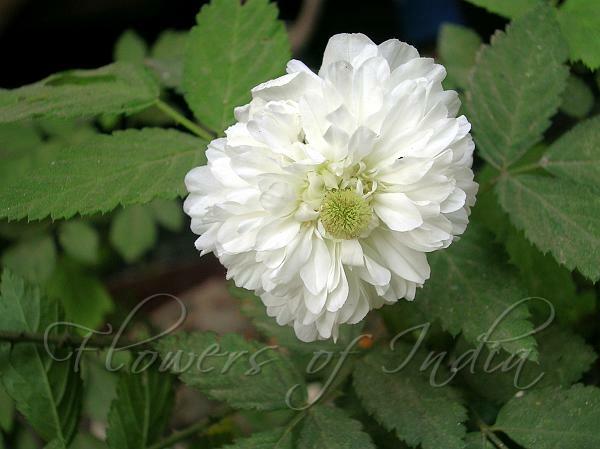 Roseleaf Raspberry is native to Eastern Himalayas, NE India and SE Asia. Flowering: March–May. Identification credit: Mark Webber Photographed in Imphal, Manipur.